What does it look like to fly on faith, and faith alone? That’s easy. Anytime you fly as a passenger in a plane, you’re flying solely on faith– Faith that the stranger at the controls isn’t an absolute idiot; faith that the plane had been properly inspected and is mechanically sound for flight. More than likely, as a regular person boarding a plane, you aren’t sure of either of those things. You’re hopeful… But you’re not one hundred percent sure. Flying is all about faith, really. You see, there are two different types of flying—VFR, where you operate by Visual Flight Rules and can see where you’re going, and IFR, where you are operating under Instrument Flight Rules. 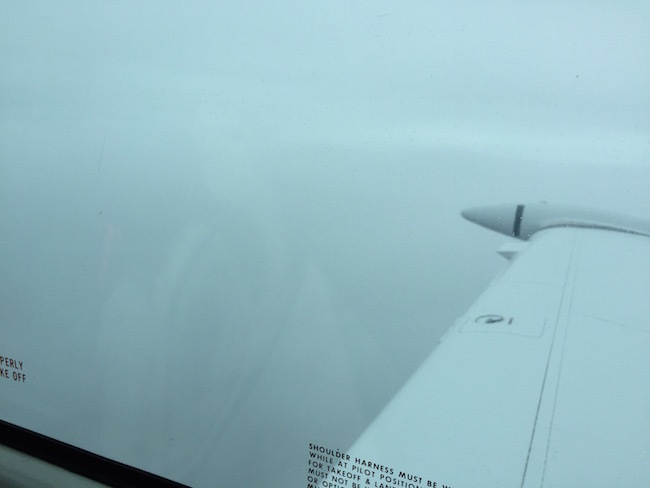 In layman’s terms—when you’re flying IFR, you can’t see where you’re going all the time. You have to rely on your instruments: your altimeter, GPS, compass, etc. Lake Clark Pass in all it’s VFR, summer glory. Last summer when I visited Port Alsworth, the VFR flight conditions couldn’t have been better (even though I didn’t know it at the time). As we flew over the wetlands outside of Anchorage on my first ever approach to Port Alsworth, the weather was perfect and clear. So clear, in fact, that I could see brown bears running awkwardly along the streams below us, chasing their salmon dinners. 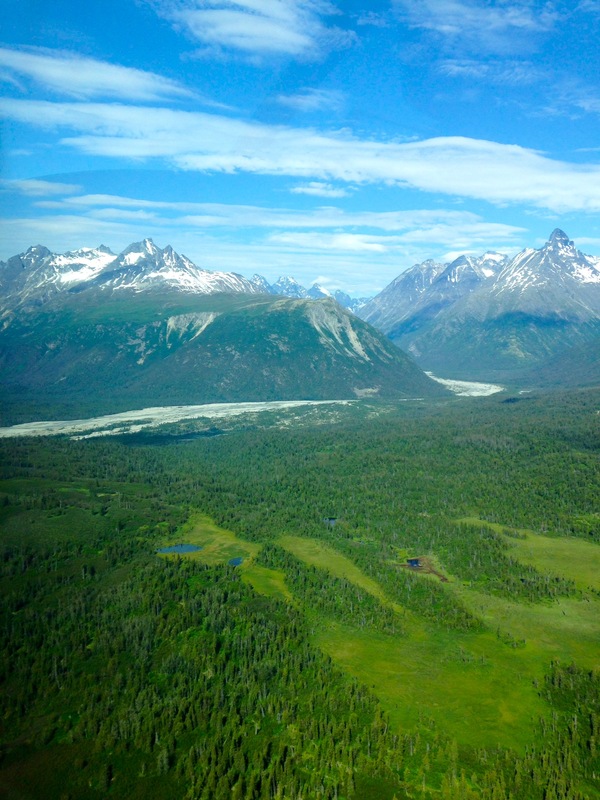 The glaciers we buzzed by in Lake Clark Pass were a crisp turquoise, reflecting the bright blue sky above and the teal hue of Lake Clark below. 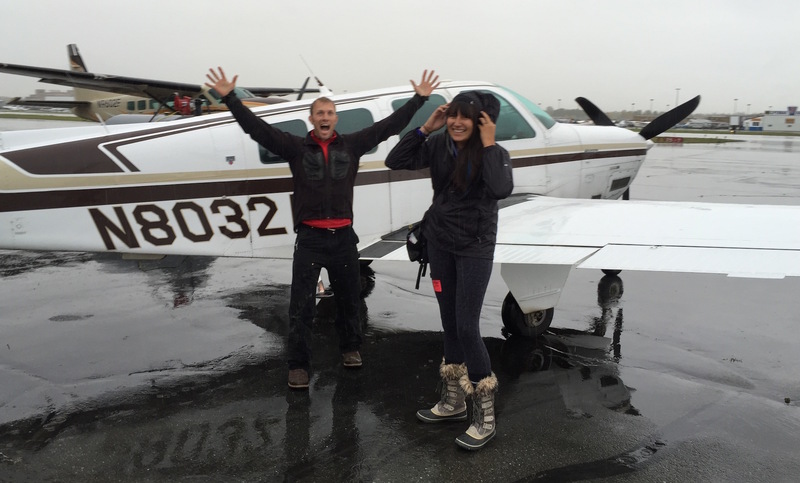 Oh, it was a sight to behold… A true VFR miracle for a first time bush plane passenger. Flying into Port Alsworth this September, was a bit of a different story. Alaska greeted me on September 15th with a slush/rain storm that made flight in a tiny two-seater airplane seem a bit more difficult. As I sat in the Lake and Pen Air office at Merrill Field Airport that morning, I stared out at the windy conditions and rapidly changing precipitation. I half-way expected my bush flight to be delayed, if not cancelled entirely. After all, even the giant Alaska Airlines plane that carried me to Anchorage had hit so much turbulence the night before that it seemed like we were going to fall out of the sky. 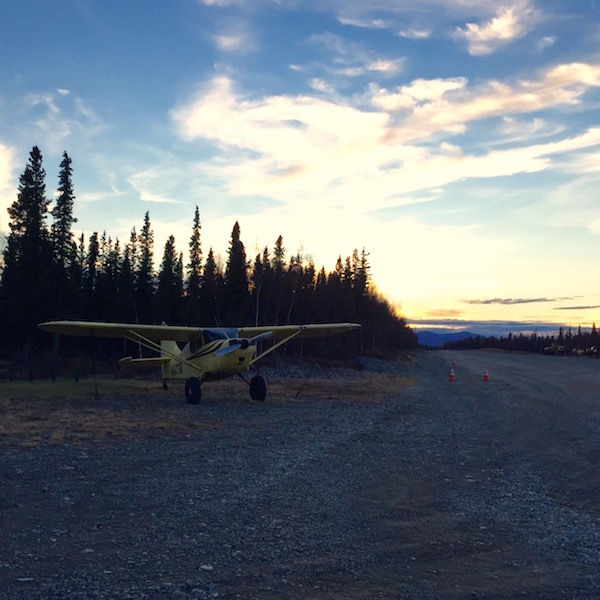 But sure enough, at a little after ten o’clock, my wild child of a pilot came bursting into the LPA office, announcing that I was the lucky winner of a one-way flight “home” with him to Port Alsworth. This guy… He is just one of my faves. As we loaded my bags into the tiny plane, word came over a radio that a plane had just crashed in Iliamna—just 20 miles from our destination. Eeesh… not exactly reassuring… I thought as I grabbed Lyle’s hand and he pulled me up into our plane. I made some comment about bush pilots not being deterred by much, to which he simply laughed and told me that this flight was going to be an easy one. We taxiied down to the end of our runway and I watched as my pilot punched buttons, radioed people I couldn’t quite hear, and then hit the throttle. Before I knew it, we were hauling down the runway, and then lifting into the headwind and the clouds above us. My view (or lack there of) leaving Anchorage. “As I sit in this plane and watch water droplets from the melting snow roll past my co-pilot window, I am amazed with who You are, God. It amazes me that I’m in Alaska—in this plane. It amazes me that this little metal box is somehow flying through the sky… It amazes me that my pilot knows where we’re going because the snow/fog/cloud mix is so thick that I can’t see anything around us. My memory knows what this mountain pass looks like from last summer, and yet this trip is so different. There are no mountains or glaciers to ‘oooh’ and ‘ahhhh’ at; I can’t see anything running in the wetlands below. There is just here, and just now; just You and me (and this really funny guy named Lyle). When I wrote that, I didn’t understand that Lyle was flying IFR—by his instruments and not his eyes. I didn’t understand the difference between IFR and VFR, even though I too was operating within my own type of IFR journey. 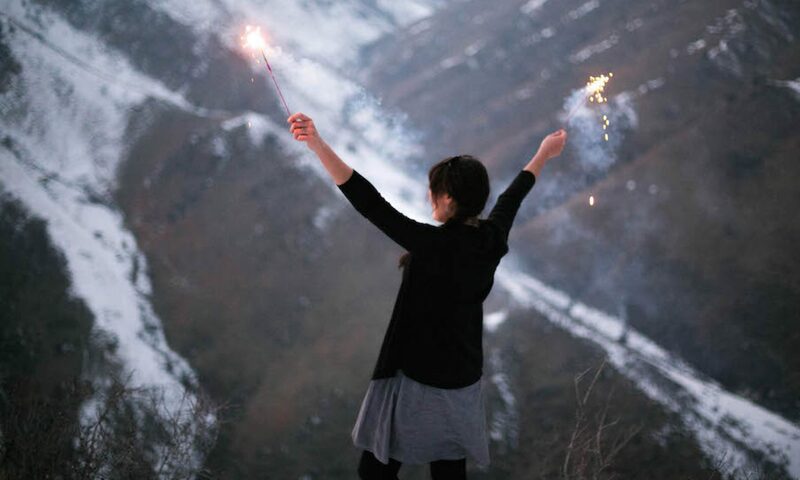 After all, I knew that God was calling me to Alaska even though I couldn’t see why; I’d known that with every fiber of my being since that weird moment in church on Super Bowl Sunday. I had spent the last seven months fine tuning my “instruments” through time with Jesus, setting up a “flight plan”, and learning who I was going to be on the journey with. I had been praying and crying and learning more and more what I looked like to walk by faith and not by sight. The questions were legitimate, and my answers hinging on faith often felt as if they weren’t. Yet because He is True to His callings and True to His promises, He provided in abundance financially, spiritually, and emotionally; even as I write this, looking out at the planes landing next to my house in Alaska, all I can do is laugh at how Good He really is. He will never leave me, nor forsake me. (No matter how many times He has to reassure me of this.) He promises to be the Light before me, even when I can’t see more than a few feet in front of my face. He has been my most reliable “instrument” as I have learned to fly out of my comfort zone with Him. His grace, His Love, His mercy; they are unfailing. Even though it has been terrifying to blindly fly away from everything that I love, I have been unexplainably blessed by experiencing more of Him through it all. It is terrifying to fly thousands of feet in the air, suspended by nothing but the faith that instruments will carry you on to your destination, and yet we do it all the time. It is terrifying to be here alone sometimes, but by faith I maintain that I am not alone because I am with Jesus, my sweet Abba, and His Spirit. But what I do know is that flying by faith alone most beautiful, addicting feeling in the world and there is no place I’d rather be than here, in His Love. Where is He calling you to follow Him today? Will you choose to fly with Him, even if you can’t see what’s in front of you?